Data sharing across the supply chain is the biggest container shipping challenge for carriers, a technology summit hosted by INTTRA revealed. The summit, held in Hamburg, focused on moving from innovation to action and was attended by more than 130 senior shipping executives including container shipping lines, shippers and BCOs. 82% of responders said process automation and digitalisation. 53% are focused on blockchain. 51% are working to improve reporting and analytics. 46% said data sharing across the supply chain. 31% said overcapacity on trade routes. 31% said reporting and analytics. 50% said managing demurrage and detention. 40% said managing rates and rate changes. 40% said managing bill of lading and other shipping documents. What are the biggest challenges you face turning innovation to action? 45% responded lack of IT resources inhouse. 42% responded lack of prioritisation. 40% said lack of budget. *Participants were able to select more than one answer to these questions which is why the percentages do not total 100%. 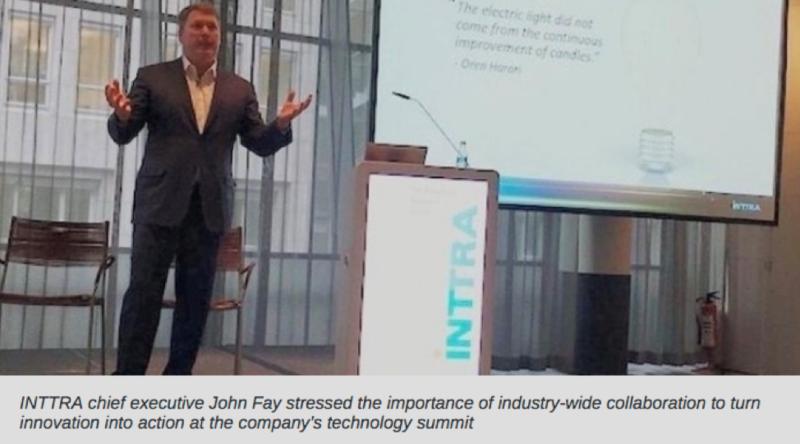 INTTRA president and chief operating officer Inna Kuznetsova said “By listening to our industry, we can design products that elevate key issues for customers. A great example is an automated management of contracted rates that we are starting to pilot as a way to tackle a difficult challenge highlighted during the summit. INTTRA has announced a rates pilot intended to optimise the management of negotiated and contracted ocean transport rates. The current system for managing rates often leads to errors as high as 30-45% with incorrect freight invoices due to how contract rate changes are managed and communicated. The pilot programme follows a successful proof of concept that involved a major carrier and INTTRA’s Blockchain Network Services.